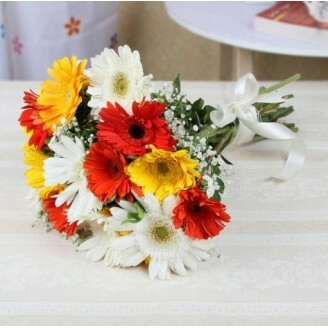 A beautiful bunch of gerbera flowers filled with love and compassion for your loved ones. Whether you're sending her the first bouquet or you're celebrating your special anniversary together, this beautiful combination of multi-color Gerberas bouquet will be the perfect way. It is the symbol of pure love and warm affection, this marvelous floral arrangement makes the most beautiful gift on your special day of love, thanksgiving, get well soon. These gerberas will surely bring a smile on the face of the person you plan to gift this beauty to.